Sometimes, my ignorance astonishes me. If you asked me about the Ilocos region before this trip, all I could tell you is what I learned about in grade school. It is composed of two provinces, Ilocos Norte and Ilocos Sur, located in the north-western part of the Luzon, the largest island of the Philippine archepelago. Main provincial products: Tabacco and Corn. Weather: hot, dry and somewhat arrid. In short, pratically nothing. So when A. suggested we take a trip north, I was a bit skeptical. Mostly because of my lack of information about anything beyond Baguio and partly because, I knew that if we drove north, it would a very, very long road trip. But after a little bit of persistent persuasion (see kulit) courtesy of A, a bit of research on the web and some helpful suggestions from very well-informed acquaintances, we packed our bags, gassed up the car and traveled Ilocos bound. After nine hours of driving, A. and I arrive at our first destination, the city of Vigan. I wish I could say that we immediately took in the historical sights of city. But it’s noon. And after sitting in a car for most of the morning, I’m looking to reward myself with my first authentic Ilocano meal. So after we leave our vehicle with the kind people of Villa Angela, we hop on a tricycle and head directly to Kusina Felicitas. After a quick perusal of their menu, we ignore all the European, Asian and Tagalog dishes on offer and center our attention on the three pages of Mak-Makan ti Ilocos. We start with a dish with an unusual name, Poqui-poqui (P75). Described in the menu as a Ilocano omelet of eggplant, this dish reminds me more of Tortang Talong, a popular dish of pan-fried aubergine, topped with ground beef and coated in thin layer of egg wash. Honestly, I don’t particularly like Tortang Talong. Or more precisely, I am not a fan of any aubergine dish. Until I try this one. Made up of eggs, tomatoes, onions sauteed with roughly chopped grilled eggplant, this scrambled mixture is not much to look at but its smells and tastes are hard to resist. I end up finishing the whole plate. It almost seems a sacrilege to have an Ilocano meal without Bagnet (P160). A and I weren’t going to have a first authentic Ilocano meal without it. To describe this dish as merely deep fried pork belly would be an insult to those who have put in the time and effort to create this dish. Bagnet is all about the process. First, the pork belly is boiled in salt water to soften. It is then taken out and made to rest. Slowly deep fried in oil. Again, taken out to rest. Chopped into bite sized cubes. And right before serving, the Bagnet is quickly deep fried again to heat and crisp. Once served, you end up with crunchy, golden brown cubes of sinful pork deliciousness. Bagnet is often served with a side dish of KBL which stands for Kamatis, Bagoong and Lasona (tomatoes, fish sauce and shallots), a perfect complement to the fatty Bagnet, because of its intensely sharp salty, sour taste. Being the pork lovers that we are, this wouldn’t be our last serving of the lovely Bagnet. In fact, this dish would be a welcome constant culinary companion on our trip. Always wanting to trying the unusual, I order the Ginisar nga Ipon (P150). Ipon is a small, seasonal fish, indigenous to the region. Only available between the months of October and February, we somehow luck out and are able to sample this dish in March. Thank you to the Ilocano food gods. Fried in a pan with tomatoes, onions and eggs, this dish is primarily salty with a thin, crispy bite. It was a delight to eat at the time but really, I could not fully appreciate the reverence that Ilocano seem to have for this fish. Maybe we should have had it prepared another way. The venue of our first Ilocano meal may have a bit touristy. But after a long drive from Manila, this was still a much-needed stopover and an excellent introduction to the home-grown cuisine of Ilocos. After a few more hours, we reach our home during our stay in Ilocos, Sitio Remedios Heritage Village Resort. What makes Sitio Remedios so unique is its mission to introduce guests to the Ilocakandia through its architecture, art and of course, their distinctive food. One can learn so much about a region by merely trying the local fare. At our temporary home, food was always in abundance. As one of our hosts jests, at Sitio, they serve one meal–it starts with a breakfast of longanisa and daing and ends with a midnight snack of tsokolate eh and soft biscochos. 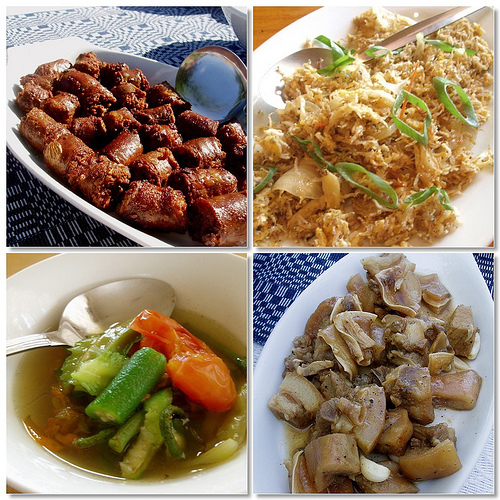 For breakfast, how about some Longganisa from the nearby town of Batac? Practically, every region of the Philippines has one version of this sausage but this garlicky, savory and somewhat less fatty longganisa was delight to tuck into every morning. 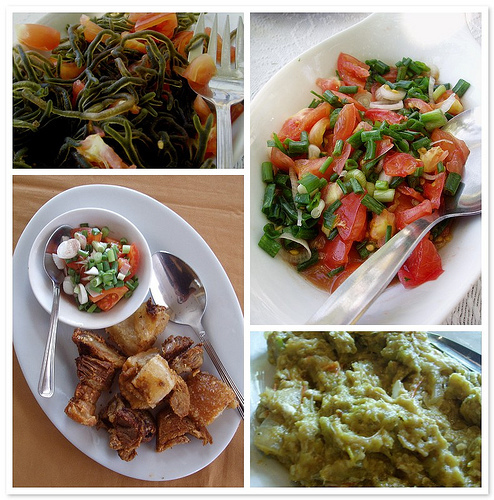 For lunch, Pokpoklong, a unique seaweed collected on the shores of Ilocos in early mornings, served with sliced tomatoes and dressed with locally produced sugarcane vinegar. For dinner, Adobong Maskara, a commonly made stew of vinegar, soy sauce, peppercorns, garlic and bay leafs but made uncommon by using both pork cheeks and ears (in fact, the whole pig’s face!) as its main ingredient. Morning, noon or night, eating at Sitio Remedios is always an adventure. I will talk about Sitio Remedios at greater length in a later post. It’s our second day in Ilocos Norte. Time of a little excrusion further north. When you ask Manilenos where to eat in Ilocos, La Preciosa will, more often than not, be mentioned. After an hour’s drive from Sitio Remedios, we arrive in the city of Laoag somewhat famished. The sights can wait for now. Lunch is the first order of business. Located in the capital city of Ilocos Norte, this restaurant is two-story building along a busy provincial street. The look of the place is honestly not very memorable but we are here for the food which didn’t disappoint. Once seated, A insists we tuck into the Bagnet with a side of KBL (P130) once again. I don’t complain. I love my pork. La Preciosa’s version of Bagnet is probably the best looking and tasting we had. But really, we enjoy this dish no matter how or where it was served. In spirit of exploring the unfamiliar, two Ilocano dishes catch our fancy: the Crispy Dinardaraan (P120) and the Dinengdeng (P130). The Crispy Dinardaraan is a drier version of what the Tagalogs call Dinuguan, a stew of pork parts and innards simmered in pig’s blood, vineger, garlic and chilis. It’s an acquired taste even among us natives. It’s a flavor I heartly dig into whenever the oppurtunity presents itself. It was pretty much a no-brainer for me to try this Ilocano take on this popular Pinoy dish. This version is cooked to a point where the pork parts are crisp and have a bit of bite to them. If you can get over the phobia of eating innards coated in dried pig’s blood, I promise it’s a taste one doesn’t soon forget. My closest approximation? A blood sausage is cut open and fried to a dry crisp. As much as I have an affinity for the more stew-like version of the Tagalogs, I wouldn’t mind having more Dinardaraan if given the chance. Next, we try the Dinengdeng, a somewhat clear soup of fish and vegetables. Although the menu claims that there is grilled fish in this dish, in reality it is all about the veggies. What traces of fish flavor comes from the infusion of the local bagoong, a sauce made of fermented fish with the broth. In many ways, the soup reminds me of a more popular Ilocano vegetable dish called Pinakbet only because the myriad of squash flowers, okra, ampalaya and several types of beans that have taken over my bowl. Admittedly, the Dinengdeng is a welcome break from all the pork and pork by-products but really, I don’t think I’ll be trying it again. Pass the Bagnet, please. It was day four of our Ilocos adventure. And if you stay as long as we did, you will tire of the bagnet and all. A body can only take so much deep-fried pork. Once this happens, head for the town of Badoc and look for Minos. Just two blocks for the Juan Luna Shrine, Minos Italian Eatery is a very small restaurant in the converted garage of one story bungalow. Don’t worry about getting lost. Ask a local. There is nothing like Minos within a fifty-kilometer radius. Minos is owned and operated by Giacomo Iavagone or Minos for short. A proud son of Como, Italy, Minos had been traveling back and forth between Italy and the Philippines since 1998.But two years ago, he decided to settle down in Badoc and open up his own eatery. From his tiny kitchen, Minos with the help of his assistant serves up simple Italian pasta and pizza dishes at amazingly low, low prices. On our visit, A. and I decide to tuck in and share an order of Ravioli in a Cream and Mushroom Sauce (P30) and a large Napoli Pizza (P180). In retrospect, I will not say that Minos serves up the best Italian food ever. But if you have been subsisting for several days on fresh fish and vegetables and all the longganisa you can eat (such a tough life in Ilocos), then getting a slice of pizza in the middle of Ilokandia will be like an island oasis in a sea of bagnet. 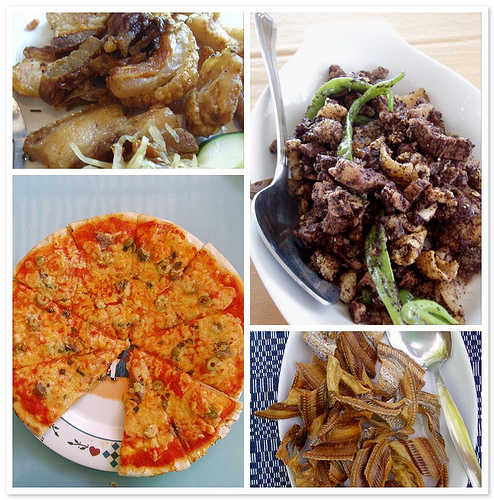 Taking a break at Minos will prepare any food weary traveler for more Ilocos culinary adventures to come. And there is much more to come. Stay tuned. Many thanks to Christine, Chichajo and Marketman for showing the way. Great photos, sounds like an awesome trip. Last (and only) time I was in Ilocos was 10 years ago ... and it was more a family bonding trip with 30 of my cousins and relatives than a food/cultural expedition. I am guessing pinakbet will make an appearance in your next post? Thanks. I imagine thing have changed quite a bit since you last visited. For the one, the road were quite good. I loved the drive. And Sitio Remedios was an delightful place to stay at. Actually, no. I really wanted to try things that I haven't had before. So, Pinakbet was a low priority. Ahh, I see. I tend to try things that are native to the province, even if I've tried 'em elsewhere. :) I did get to try a pinakbet pizza in Paoay. There's definitely been increased interest in the food of the north on blogs these days. Whither next I wonder? My brother in the Philippines sent me the link to this site. Those bagnets are making my mouth water!!! I would have loved that ginisar nga ipon! Wish I tried it then. The dinardaraan sounds like the crispy dinuguan of Kanin Club whcih I loved! I'm not a big dinuguan eater, in fact, I will generally ignore it on the menu or on the buffet table. But the Kanin Club version was amazing, like bagnet/chicharon in dinuguan! I wonder if it was inspired by this Ilocano dish. I should be thanking you both. Really, until you two wrote about your own Ilocos trip, I wasn't really looking forward to the trip. Lucky for A, there is nothing worse than an uninspired driver on such a long drive. Recently I had taste of Mino's Italian Restaurant or Eatery. We arrived there for dinner and they're only open until 7:30pm. On the way there my friend's niece kept on raving on their Ravioli (which is now Php40, just to update your price-hehe). For me the food was great, considering their prices are only either Php40 for pastas, etc. or Php220 for their pizza. Too bad I wasn't able to take photos of our sumptuous plated dinner because it was soooo dark and their dining/garage lighting was warm yellow light. Good thing our host knew the owner , who sampled us with Sangria while waiting for our meal.